Guyana has joined the Islamic Development Bank (IDB), officials said at the bank’s annual meeting in Jakarta, as Islamic finance expands globally by offering countries access to cheap loans. Around 10 percent of Guyana’s population of 800,000 are Muslim, and Islamic finance activity in the country is minimal. Membership of the Jeddah-based based IDB, a multilateral lender dominated by Muslim-majority states including Saudi Arabia and Iran, will give Guyana access to loans at concessionary rates. In the long term, it could also encourage sharia-compliant banks and companies from the Gulf and southeast Asia to do business in Guyana. By joining the bank, Ali said that Guyana will receive finance to development various sectors, in particular in the area of infrastructure. Also present at the ceremonial opening of the 41st governors meeting was the vice president of Indonesia, Jusuf Kalla, the governor of the Bank of Indonesia, Agus Martowadjojo and former president of Indonesia, BJ Habibie. Finance minister of Guyana, Winston Jordan, is making his debut appearance in Jakarta personally to witness Guyana’s initiation into the group. According to the finance ministry press release, this membership allows Guyana “access to concessionary resources, grants and interest free loans.” “This will greatly assist in financing the government’s development agenda; redounding to the ‘good life’ for all citizens. The areas of intervention of the IsDB include human development, rural development and food safety, infrastructural development, trade among member countries and private sector development, research and development in Islamic economies and banking and finance,” the statement read in part. 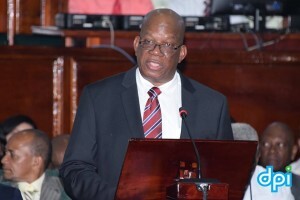 Guyana is the 57th country and the second from Latin America after Suriname to join the AAA-rated IDB, which aims to “foster the economic development and social progress of member countries and Muslim communities.” Kenyan officials have said their country may also join.